The 17" size is the most popular size full acoustic archtop guitar. Here they can be made in a variety of styles ranging from traditional to more modern. Beautiful and carefully chosen woods can be substituted in place of traditional appointments for a truly one of a kind instrument. The top and back are both individually carved and graduated by hand for the optimum voice. 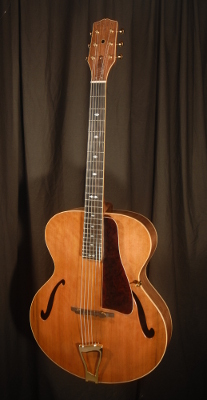 This is an example of of a more traditionally styled 17" archtop guitar. like a traditional instrument this is equipped with a metal "trapeze tailpiece, adjustable bridge, plastic binding (in simple or elaborate styles). The back, sides, and necks are figured Walnut . The top is Western Red Cedar. Pickguard is Tortoise style celuloid bound to match the body. Other accents are a combination of Curly Walnut, Maple. This is an example of of a more contemporary style 17" archtop guitar. There are wood bindings and purling throughout. The back and sides are premium Tiger Stripe Maple . The neck is Maple and fingerboard is Ebony. The headstock face is figured cherry. Pickguard is layered Cherry, Ebony, and Maple to match the binding and is topped off with crotch figured cherry . The tailpiece has a unique shape and has materials thar match the pickguard.